This fighting style was born of the history, particularly from World War II, of Israel and is, perhaps, the ultimate martial art in the world, except to call it a martial art is like calling a street fight a dance. Krav Maga literally means close combat, and that is precisely what it is, whether using open-hand fighting, knife, sword, pistol, rifle, or anything else you can get into your hands to aid in the fight. This is not a clean style of fighting, it is not only a means of self-defense, but also a literal killing art at higher levels, and it takes from many other martial arts, such as Karate, Judo, Jiu-Jitsu, and Muay Thai, as well as introducing more than a few techniques that are absolutely original and sole to this style. Through continuous movement, striking, defending, and the ability and willingness to do what it takes to continue living while your enemy dies, this style is merciless, and distinguishes itself readily from all other martial arts and/or fighting styles. However, its greatest strength and, perhaps, its greatest weakness comes in the fact this style is just flat dirty; if you have any problem with a desire to remain honorable in combat, are not necessarily willing to look at a truly serious argument of “me or them”, or have trouble allowing your instincts to take over, then this is not the fighting style for you. Following are the stats I’ve been able to develop for my version of Millennium’s End, known as Shadow Games, from the VERY brief exposure to Krav Maga, and through research I’ve performed. These are not going to be complete, and may seem very limited, but it is necessary to keep this limited to fit within the game mechanics. 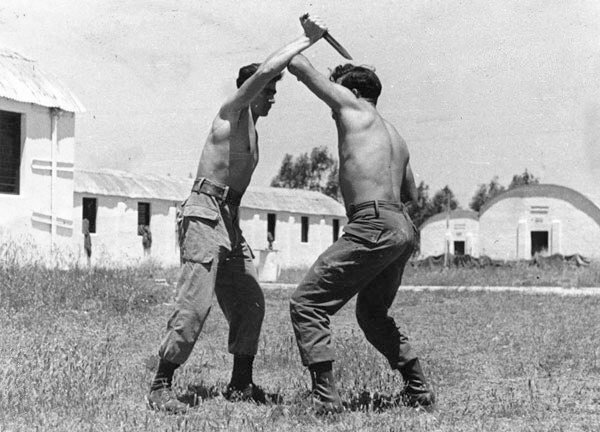 Since Krav Maga borrows from so many other styles, it really does not have a style all its own, unless killing your enemy and defending your own life is considered to be that style. Therefore, the more important parts of this style are in the techniques rather than the skills. Techniques: Combination Maneuvers, Pain Hold, Break Hold, Disarm, and Bursting (see below). Bursting (yes, this is the maneuver’s actual name): This technique is specific to Krav Maga, as it uses the combination of a powerful thrust from the legs, blocking an attack and striking that attacker at the same time. Though it could be considered very similar to a Combination Maneuver, it is different in that the Combination Maneuver first allows for a defensive move followed immediately by a full attack, rather than an attack used as a defense, and followed by an actual attack, with the added benefit of pushing away the attacker in a further attempt to unbalance them. For an attacker to defend against this attack, they may use Unarmed/Dodge or Grapple from the skills category, or Negate Defense as a Technique. The damage done by a hit from Krav Maga Bursting is roughly one-half normal, though using Unarmed/Combat Roll counts for the character’s defense and simultaneous attack. The normal means of determining the Delivered Damage from a hand-to-hand hit is the character’s Damage Rating, each point being 1d10+1, the rolled amount divided by ten and rounded out for DD (Delivered Damage) and, if a melee weapon is involved, multiplied by the Damage Factor (DF) of the weapon; for the initial attack/defense, the DF outcome number is halved. Bursting does damage, as well, equal to one-half, rounded down, of your character’s Damage Rating, with 1d10+1 added, as with the Increase Damage Technique, for every full ten points by which you succeed at your Kata/Krav Maga roll; any Damage Factor from weapons is ignored for this part of the damage. As this is a new martial art in our game, it is subject to modification, so you might want to look in on this fairly often.